Transitional. Whilst not quite replicating the elongated saga that was Gareth Bale's move to Real Madrid, the outcome of Neymar's eventual departure from Santos to *wherever* was a topic that had occupied world football for most of the last few years. Despite overtures from the most ostentatious in England and France, and the more leftfield, but far from unreasonable interest from the Bundesliga beribboned, there was only ever going to be one decision for Neymar to make: Real or Barca? This time last year we questioned just how much longer Neymar would/could remain in Brazil. The vigorousness and dashing of the 2011 Copa Libertadores winning Santos side had evolved into something a little more listless. The hyper-destructive triple axis of Neymar, Paulo Henrique Ganso and the prodigal Robinho was a distant memory as the Serie A season drew to a close with Santos entrenched in midtable. Despite the youthful promise of several players following in Neymar's wake, injury and eventual decant curtailed Ganso while Robinho had returned to Europe. For most of the last twelve months, Santos have been a one man team and, while not exactly in neutral, Neymar looked more like a player kicking his heels in the departure lounge rather than a young buck inspiring his cadre to scintillating greatness. Not that this is a criticism, he continued to play the passes, perform the heroic and score the goals throughout, it all just felt a little hollow. There may well have been a strong argument for keeping the boy wonder in his home country right up until the World Cup, perhaps even if only for merchandising reasons, but it was clear at the start of Serie A 2012 that Neymar had overstayed. By holding on to their man Santos risked their prize asset declining in value in tandem with his contract. For the player, performing well for a stodgy middleweight was going to do little for his development. And so a move to Barcelona ensued earlier this year, but not before the world was given advance notice of just what a redoubtable force a Neymar fused Brazil could be. Exceptional at a surprisingly glossy Confederations Cup, Neymar thoroughly deserved his crown as player of the tournament. Dispatching strong Italian and Spanish sides on home soil laid a clear marker for those pesky Europeans intent on liberating the ultimate prize from South America's embrace. 2013 might not have categorically been Neymar's year, but there is more than enough evidence to suggest 2014 could be. Neymar Europe has begun as well as can be expected at Barcelona. Our hero is, after all, one of the world's very best playing as part of one of the world's very best teams. To suspect he may have struggled offers neither appropriate credit. Now, the weight of expectation is no longer solely on the shoulders of one young player. Neymar can probably stroll through quite a few bad performances and find that his team have still been victors by five clear goals. Playing alongside the established first world order of Messi, Xavi and lniesta provides him the opportunity to flourish and really demonstrate what he has. The hand brake can be completely withdrawn and the one player that can do things that Leo Messi can't has the chance to steal the show. In a world where there is a growing consensus that Tiki Taka has become something of an old record, and amid claims Messi's brilliance is no longer anything more than routine, Neymar offers an element of Rock Star bravado and the prospect of his magical act as a side order to purring magnificence might just re-energise Barca. If Bayern Munich think the floor is theirs, be warned, your old adversaries might just want their ball back. Neymar is an excellent footballer that will continue to develop with better players around him. The wiry frame remains freakishly strong and the speed of thought and movement seem to improve with each season. If there is an area of concern it is that the demands of European football, via the combined rigours of La Liga and the Champions League, take a toll on the young master. He's used to playing a lot of football of course, but the physical and mental requirement of such a significant step up should not be underestimated and could erode the potential impact of the star man exactly when his country needs him. That said, early indications suggest that Barca will probably win their league at something of a canter and the opportunity to rest Neymar is a luxury that Barca coach Gerardo Martino will be able to afford, no doubt with the vigorous blessing of Luiz Felipe Scolari. 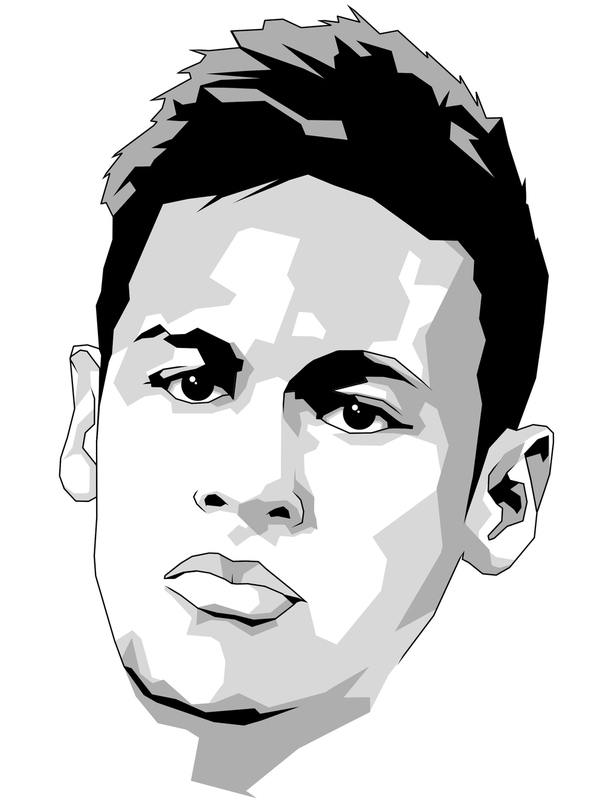 Fortunately, Neymar will make The IBWM 100 for 2014, so we can pass judgement on him once more. By this time next year, our marking may reflect a player that has inspired both his club and country to the most cherished prizes available to them. Good luck.